Um… What? Memories don’t have a look, nor can anyone tell what someone’s memories are just by looking at the person. (Even mindreaders have to read minds to get that sort of information.) The first sentence can be fixed, though, by deleting who looks. You answer the door to find someone exactly like you, down to your memories until the moment this person appeared. 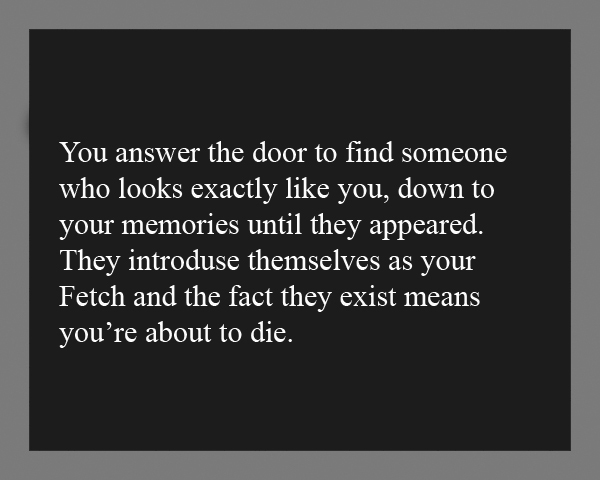 They introduce themself as your Fetch, and the fact that they exist means you’re about to die. This entry was posted in Writing Glitches and tagged glitch, obscure fiction-reference humor. Bookmark the permalink.